If you heard the words â€œguitarâ€ and â€œenvironmentâ€ in the same sentence in the last few months you were probably hearing about the raid on Gibson Guitar. While the August raid on Gibsonâ€™s factories continues to draw a lot of attention and still gets conservatives and Tea Party supporters angry, another guitar company is coming up this week with an innovative effort to connect the dots between guitars and the environment in a positive way. On Tuesday, C.F. Martin announced that it will utilize FSC-certified recycled Sitka spruce in one of its new cutaway guitars in the companyâ€™s Performing Artist series â€“ the GPCPA4 Sapele. Now, here comes the good part â€“ the wood, which will be used on the tops of the new guitar, is coming from none other than dismantled Canadian bridges where it had been used in construction. 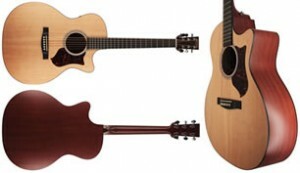 â€œMartin Guitar has long been committed to research and innovation to find alternatives to rare woods,â€ explained Chris Martin, the companyâ€™s chairman and CEO. â€œThe use of this recycled traditional tonewood will complement the Sapele wood that this guitar utilizes, allowing us to achieve the same structural integrity and traditional Martin sound,â€ he added. The search for such innovative solutions is not accidental, especially for a guitar maker with sustainability in mind like C.F. Martin. â€œIn order for a musical instrument manufacturing company to become more sustainable, they have to look at the primary resources from the planet that theyâ€™re using and get those resources in the most environmentally sustainable way,â€ explains Scott Paul, director of the forest campaign for Greenpeace. The Gibson Guitar Company was very responsible in purchasing of wood for their guitar manufacturing and openly supported conservational harvesting. Their wood had the approval of the exporting countries and the USA Customs. The Obama Justice Department sent the FBI and Fish and Game Waco-style Swat Team into the manufacturing company with automatic weapons drawn intensively questioning management and workers on the manufacturing line for up to five hours at a time each making implied threats. The government thugs took enough materials to cripple the company. The Gibson Guitar Company paid for lawyers to defend their employees as well as management. The company was not charged with a crime or even given a hint of their wrong doing. This has happened to this company twice. The Justice Department has been dragging their feet while the companyâ€™s resources dwindle and the suggesting Gibson should move manufacturing overseas. I am not sure we want to accept the new meanings of â€œinnocent until proven guiltyâ€, â€œunreasonable search and seizureâ€ and â€œdue process of lawâ€. I say we keep the Gibson Guitar Company in the USA and exile the Obama administration to Madagascar. Don’t you possibly think Obama has a few more pressing issues to deal with than worry about a couple of guitar companies? I’m English, I have no interest in your paranoid Republican rantings, or any Democrat ones either for that matter, sorry.. I suggest you go find Glen Beck’s forum and talk to like -minded individuals there. You would think they would have more important things to worry about. I would say the evidence shows otherwise. I don’t think Ed is being paranoid just observant.